Kevin Hillstrom: MineThatData: Dear Catalog CEOs: What Did We Learn In 2011? Dear Catalog CEOs: What Did We Learn In 2011? What did we learn in 2011? Learning #1 = Frustration With Co-Ops: Not because of service or problems, but because of the change co-ops have helped accelerate. Run a demographic report on co-op sourced names vs. names you acquire via Google ... your co-op sourced names are generally 55+ and rural, the result of years of "optimization". Our dependence upon co-ops accelerates the aging of our customer file. Learning #2 = Multi-Channel Didn't Matter: I've analyzed more than 300 business-years of data since starting MineThatData in 2007. Many of my clients send me ten or fifteen or twenty years of purchase data. Guess what? 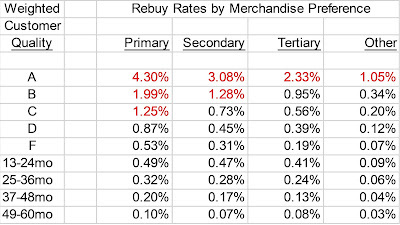 Annual Repurchase Rates, Orders per Buyer per Year, and New Customer Counts have, by and large, not changed over the past decade. Just let those facts sink in for a moment. In 1995, we mailed a dozen catalogs a year to our best customers. In 2011, we mail fifteen catalogs a year, one-hundred email campaigns per year, we offer incentives via Facebook, via Twitter, via our Mobile website, via Search, via Affiliates .... on and on and on I could go. And yet, there is no fundamental change in annual customer behavior. Customers still repurchase at the same rate. Customer still order the same number of items per order. Customers still place the same number of orders per year. Learning #3 = Core Skills Are Missing: This one comes up repeatedly, as well. People can tell me that the big blue button outperforms the small green button by 27.44393928%. Nobody can tell me if merchandise productivity is increasing or decreasing. People can tell me that free shipping with a $125 hurdle increases orders by 11%. Nobody can tell me how important new products are to a business. People can tell me that 29% of recipients open email campaigns. Nobody can tell me the percentage of the email file that orders at least once a year from an email campaign. Everything we know about our business surrounds the performance of a campaign. We've lost the ability to understand how customers behave, annually, and we've lost the ability to act upon that behavior. Learning #4 = Email Is The "Hub". Almost every project I work on suggests that best customers actually purchase at least once a year from email campaigns. Email marketing actually connects brand messaging to best customers ... I can't even believe I just said that! Earlier this year, one of you lamented to me that "email generates 25% of our profit but we only allocate 0.1% of our staffing to email". Well, folks, you can fix that! Some combination of email, mobile, and social is going to account for an ever-increasing percentage of our future profit. It is time to figure this combination of channels out before the competition figures it out. Learning #5 = Talent Dearth: When I worked at Lands' End in the early 1990s, our marketing department was LOADED with talent. LOADED. In fact, the folks I worked with have gone on start their own catalog companies, to be VPs and Directors and to generally excel in ways that were entirely predictable in the early 1990s. Can you predict that the same thing will happen in 15-20 years with the team assembled in your marketing department today? Talent is not being funneled into catalog brands, talent is going to Mobile and Social. Somehow, we have to change this. You keep telling me that you can't find talent. It might be time for all of us to start developing talent. Learning #6 = New Customers Matter: I can't tell you how often this grates business leaders, but it is true. Unless you are Wal-Mart or another ten billion plus business, you desperately need new customers. The marketing press, however, tells you all about "Eight Easy Ways To Grow Customer Engagement". We've learned that there is almost nothing more important than growing our business via low-cost customer acquisition. In fact, in the next 1-3 years, this will be a trend ... how do we find new customers at a low cost? Learning #7 = Merchandise Matters: I received an email from one of you a few months ago. This business leader lamented the fact that she only sold "branded" electronics, that the only thing that differentiated her from her competition was "price". Amen. Ask Best Buy how it feels to have a customer shop an expensive big box store only to buy the item at a cheaper price at Amazon? Catalog success depends upon unique, differentiated product. Learning #8 = A Replacement For The USPS: No matter how hard you fight, no matter how hard you lobby, the USPS is headed in a direction that is not congruent with the desires of the catalog community. Find a replacement, now. Hint, e-commerce seems to work, but requires a different "customer relationship" than catalog marketing requires. Learning #9 = How We Buy Paper Needs To Change: So many of you voice your frustration with me about the need to "buy paper" three to five months in advance, to get great pricing. You tell me that you can't implement new and innovative strategies because you're "committed to paper". We learned that this must change. Our vendors must do what's best for us, not what's best for vendors. You need flexibility. You can change this, only if you mobilize as a unified front. Learning #10 = Free Shipping Will Be Mandatory: And the only way you'll deal with this is to mail fewer catalogs to online/mobile/social-centric customers, regardless what the industry tells you. I found new clients over $12,000,000 profit this year by mailing fewer catalogs to online-centric buyers ... and that's just little 'ole me, imagine what the real opportunity actually is! We'll have no choice but to compete with free shipping by offering free shipping ourselves. We'll pay for this via housefile catalog circulation reductions. Learning #11 = They're Lying To Us: Well, they're not lying intentionally. Here's a heading I read this week ... "Triple Website Visits by Adding a Facebook Like Button". Really? That's how we triple website visits? We have to really, really filter through content to find nuggets of gold. And it is getting harder and harder each day, isn't it? Learning #12 = The Industry Isn't Always On Our Side: This year in particular, we learned that trade journals host blogs, and those blogs are designed to mock us when we make mistakes. Worse, the vendors we pay money to pay to advertise on said blogs, taking our money and using it to help mock us. Even worse, industry consultants openly point out our faults on their own blogs. Why? This isn't acceptable, and needs to change. Learning #13 = Sell Something: If I looked across the 65-70 clients I've worked with since early 2007, there's one thing in common with those who are wildly successful ... they work their tails off trying to sell something. They don't care about channels, they care about selling merchandise. They don't care about engagement, they care about selling merchandise. They don't care about what mobile can do for them, they care about selling merchandise. They don't care about eight best practices for selling on Twitter, they care about selling merchandise. They don't care about the long-tail of search, they care about selling merchandise. We have everything backwards. We think if we utilize channels, we'll sell merchandise. Instead, the opposite is true ... if we do a great job of selling merchandise, channels will perform well, allowing us to expand into new channels. Learning #14 = Best Practices Stink: Oh, I'll catch garbage on Twitter for saying this, but it is true. Since when do we trust a vendor to tell us what the "best practices" are? When you have a "trade secret", do you tell everybody what it is so that your competitors can copy it? I mean, I do that, but you certainly don't do that, nor should you! These days, "best practices" are something that a vendor tries to sell to you in order to benefit the vendor. They're sometimes shallow and empty. But they are seldom practices that will grow your business by 10%. Nope, those practices are your responsibility. 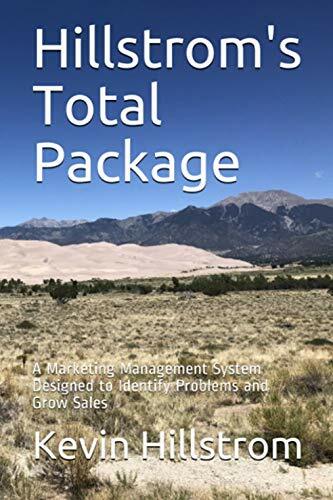 Learning #15 = Incremental Sales Are Hard To Come By: My projects continually indicate that the vast majority of sales are not "incremental". This creates division within our industry ... we want to attribute every sale to a marketing activity, when the reality is that customers simply buy from us for reasons other than the advertising we just executed. Think about the problem this way ... you need toilet paper, so you go to Wal-Mart to buy it. Does a Wal-Mart television commercial that you viewed yesterday deserve credit for your toilet paper purchase? No, this is not an "incremental" purchase caused by marketing. The same situation happens in your business every day. Only ego prevents us from understanding this. Once we understand that customers place orders because they love us, not because they love our advertising, new opportunities immediately present themselves to us. Learning #16 = We Have A Chance To Be Wildly Successful: Yes, we have a chance to be wildly successful! The choice, is ours, however. We get to decide if we're going to be successful Deep down, we know what we need to do to be successful. We're going to be successful by offering superior merchandise, great service, fair pricing. We're going to be successful by choosing valued business partners. We're going to be successful by developing talent. We're going to be successful by taking risks, by being willing to be wrong.